Whether you’ve been in Orlando your whole life, recently moved to town, or you’re just here for a weekend getaway with your significant other, Central Florida has plenty of unique, rich culture to share. From art created by Orlando natives to locally-brewed beer, this beautiful city offers it all. We’ve compiled a list of some of our favorite pop-up Orlando art markets and local shops for a perfect Orlando date spent shopping local. Get ready to shop, sip, snack, and stroll through Orlando’s best local art markets. The DeLand Indie Market brings together local artists, boutiques, and vintage vendors from all over Florida. This market also features live music and delicious food in the Courtyard at Café DaVinci. It takes place at Artisan Alley in DeLand, Florida, four times a year. A rotating selection of vendors is featured each time. The next pop-up will be held Sunday, December 2, 2018 – just in time for the holidays! This time you can expect to see some of the following vendors: Flamin’ Raymond’s Hot Sauce, Bloomwolf Studio, Avec Desire Vintage, The Roving Nomad, and so many more! What’s cooler than a vintage flea market? Held in Ivanhoe Village in the parking lot of The Carousel Emporium, this market brings together vendors selling furniture, jewelry, pottery, clothes, and more – and it’s all vintage or antique! No matter your taste, you are sure to find some neat treasures at the Carousel Emporium. You can check it out on the 2nd Saturday of each month from 8 a.m. to 3:30 p.m. The monthly market makes for a complete date night with live music and local bites! East End Market’s new monthly program will inspire and empower the Orlando community. Evening Exchange (EvEx) aims to build community through interactive workshops, demonstrations, food specials, and more. There will be tons of Orlando’s most talented vendors and artisans in attendance showcasing and selling their work. Attendance is free, so be sure to check it out the third Friday of each month starting at 6pm! Stay tuned to Facebook for a list of vendors. Will’s A Faire is the largest indoor/outdoor vendor market in town! It happens only four times a year at Will’s Pub on Mills. Over 70 vendors fill the space with local retro, indie, and vintage treasures. There are also food trucks, drinks, and of course live music! This Sunday, December 2, 2018, you can check out the final edition of the market for 2018 with a holiday twist! The event is free and lasts from 1 p.m. to 8:30 p.m. For details on performers, food trucks, and vendors, check out the Facebook event page. A local art market with wine as part of the name? Count us in! 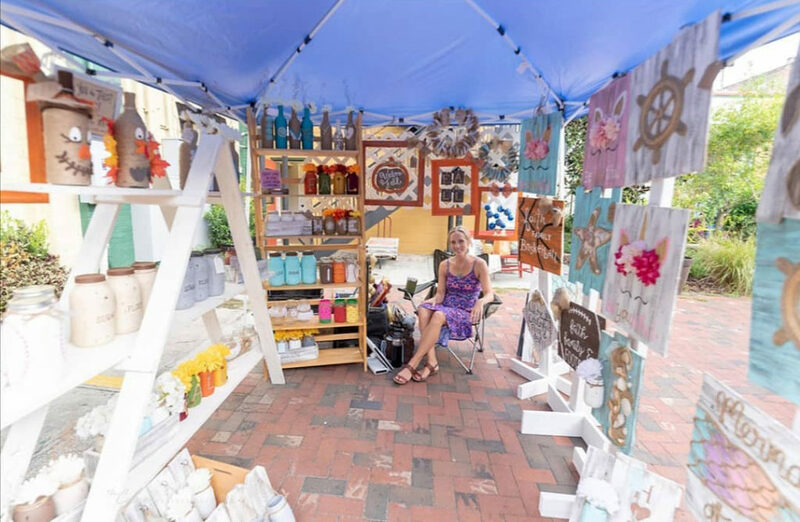 On the first Wednesday of each month, Downtown Lake Mary’s Central Park is the place to be if you’re in search of the finest locally-crafted goods. During WineART Wednesdays, you can also check out some of Orlando’s most talented artists with a local art stroll through the park, or snack on food truck fare. Be sure to stop at the beer and wine garden for a selection of craft beers and various wines. There’s typically live music from local performers as well. The event is located next to City Hall, off Lake Mary Boulevard and 4th Street. Organized by The Daily City, Orlando Flea is a unique gift market that shines the spotlight on local crafters and small businesses. Mark Baratelli, the mastermind behind The Daily City, was inspired by the hugely successful Brooklyn Flea that takes place in New York. Orlando Flea strives to celebrate our city’s rich culture & creative minds while bringing people together and inspiring them to be creative themselves. Each pop-up event features local artisans, designers, creators, and vendors. Expect to find a wide variety of local crafts, adult beverages and food, as well as live music for entertainment. At previous installments of Orlando Flea, vendors have included: Lemesto, The Chiffon Cat Vintage, Plants and Pamperin’, and Rattlesnake Soap Co., with treats from Sweet City Gelato, Halfbaked Bites, and Up in Smoke BBQ. With three Central Florida locations in Altamonte, Winter Park, and Winter Garden, Adjectives Market is “Orlando’s Destination for Creation.” Each location is filled with goods and crafts from home décor and furniture to clothing and jewelry. All 3 stores cover over 50,000 square feet, filled with miniature boutique galleries showcasing Florida’s finest artisans. Adjectives also hosts regular workshops allowing you to create your own take-home work of art. The District Market at Mills 50 is a mecca for plant-based goodies. Omnivores and vegans alike can enjoy donuts, sandwiches, coffee, and more from local pop-up restaurants. You can stop in to grab a scrumptious bite to eat, and you can also pick up locally-made grab-and-go items. The market also features works from local artists and makers with paintings, soaps, jewelry, and more for sale. Great news: this market is open DAILY! Owned and operated by a mother-daughter duo, Driftwood Market provides the finest in locally-crafted gifts, jewelry, home décor, and more. Everything sold in the shops (one in College Park and one in Winter Garden) is hand-selected by the owners and there is a huge emphasis on top-notch quality and service. Besides being such a charming local boutique, Driftwood Market regularly offers fun events and DIY classes and artisan workshops that make for such a fun, crafty date night or girls’ night out! The final workshop of the year is a hand lettering class on December 7, 2018. Every Sunday from 10 a.m. to 4 p.m., walk around the beautiful Orlando Farmer’s Market at Lake Eola. Since 1987, Orlandoans have flocked to the market to find fresh produce, handmade jewelry, homemade pet treats, and exotic plants, just to name a few of this market’s unique offerings. Plus, there are tons of food trucks and a beer and wine garden. There’s free street parking, plus plentiful paid parking at garages just a couple blocks away. While you’ll find a ton of fresh produce and eats, an entire section of the market is dedicated to local art and goods. The Winter Park Farmer’s Market is a staple in the community. Taking place on West New England Avenue just two blocks off Park Avenue, this weekly market is a must-see in Orlando. Locally-made candles, handcrafted hummus, fresh butter, and a gorgeous assortment of flowers and plants are just a few of the many unique vendors to be seen. Peruse goods every Saturday from 7 a.m. to 1 p.m. Be sure to check out the shops along Park Avenue and take a stroll through the beautiful campus of Rollins College afterwards. Hamlin Artisan Market is a weekly hub for handcrafted goods and yummy food. Thanks to the plethora of talented nearby vendors, you can always look forward to a differing selection of vendors and artisans on deck. You can find goodies like gourmet ice cream, fresh flowers, woodwork/signs, and more. It happens every Sunday from 10am-2pm in Winter Garden. The beautiful and historic Winter Garden Farmer’s Market is the perfect place to start off a Saturday date. With offerings like fresh, locally grown produce, flowers, herbs, local art, and handmade soaps, this market covers all the bases. It takes place every Saturday from 9 a.m. to 2 p.m. Plus, there’s live entertainment most weekends. Make a date out of it by grabbing a beer and some lunch at the nearby Plant Street Market, then do a bit of shopping and listen to live music at the farmer’s market! After the market closes, you can explore the rest of Historic Downtown Winter Garden. Visit the shops, head to the Garden Theatre, stroll through parks or rent bikes to cruise along the West Orange Trail.